On Thursday, March 14, hundreds gathered in the Cotillion Room of the Pierre Hotel in Manhattan for Irish America magazine’s 10th annual Hall of Fame luncheon. This year’s inductees were lawyer, public servant, and peacemaker John C. Dearie; broadcaster Adrian Flannelly; Academy Award-winning director Terry George; Irish Repertory Theatre founders Charlotte Moore and Ciarán O’Reilly; Grammy Award-winning musician Arturo O’Farrill; and NYPD Commissioner James P. O’Neill. 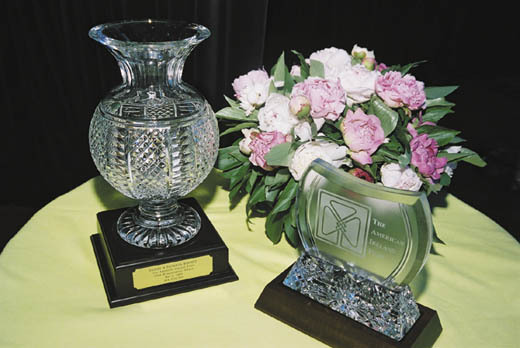 Each inductee received a Waterford Crystal Lismore bowl. The event began with a cocktail reception in the Regency Room, where the honorees and guests mingled and took photos with Irish America founders Patricia Harty and Niall O’Dowd. At noon, the inductees and guests made their way into the adjoining Cotillion Room and were seated. Niall O’Dowd welcomed everyone and introduced Adrian Flannelly, host of The Adrian Flannelly Show, which has been on the air for the last 50 years. Flannelly acknowledged his cousin Brian O’Dwyer, the prominent lawyer, immigration lobbyist, and Grand Marshal of New York City’s 2019 St. Patrick’s Day parade, as well as other family members who were in attendance, and he thanked his wife, Aine Sheridan, saying she was “the person who actually made the radio show a success. She refuses to be associated with 50 years of broadcasting because she claims she wasn’t born at that time. Adrian Flannelly speaks to the group gathered in the Cotillion Room for the 2019 Hall of Fame inductions. Flannelly also congratulated fellow inductee John C. Dearie, who spent 25 years as his cohost of the radio program. He added: “We O’Farrills like the idea of being confusing. We like being many things: Irish, German, Mexican, Cuban, jazz, classical, Latin, New Yorker – but citizens of the world, as is the predilection of the Irish…I am grateful to immigrants and the vitality that they bring to the shores that they land on. I am thrilled to know that wherever we go we initiate dialogue and bring about change.” O’Farrill then played a one-of-a-kind rendition of “Danny Boy” on the grand piano. Prominent director and new inductee Terry George shows off his trophy, which he told the group he planned to fill with fresh flowers every day. Niamh Hyland and Shu Nakamura closed out the presentation, performing “Wild Mountain Thyme.” Inductees and guests finished their desserts and mingled more before departing, taking the newest issue of Irish America on their way out. The Hall of Fame is located in Ireland aboard the Dunbrody Famine Ship in New Ross, County Wexford. Founded in 2010 in celebration of Irish America magazine’s 25th anniversary, the Irish America Hall of Fame honors the extraordinary achievements of Irish-American leaders, from their significant accomplishments and contributions to American society to the personal commitment to safeguarding their Irish heritage and the betterment of Ireland. See slideshow below for more photos of the Hall of Fame! Niamh Hyland sang “Silent Night” in Irish, and a hush fell over the room – a splendid room with tall windows, looking out over Central Park. So often at Irish events, music is the thread that holds it all together, acting as the link to the ancestors across the generations, and this occasion was no different. It was December 12, and some 250 Irish and Irish Americans were gathered for the annual Business 100 luncheon honoring Irish and Irish-American executives. It was a grand occasion that drew people from around the country; from California to St. Louis, from Philadelphia to Boston; and across the generations from fifth- to Irish-born, each honoree with his or her own memory of someone meaningful in their lives who had encouraged them to never give up on themselves. The splendor of the Metropolitan Club, decked out in its Christmas finery, gave me pause. Earlier, as Niamh, from County Leitrim, and her guitarist, Shu Nakamura, who was born in Japan, did their pre-lunch sound check, I looked out the window of the ballroom. From the height of the third floor, I could see over the horse and carriage drivers into the park. I was reminded that there was once a thriving village in Central Park called Seneca. Founded in 1825 by African Americans, the village flourished, and by the 1840s it included Irish and German immigrants. The village midwife was Irish, a fact that struck a chord with me when I first read about Seneca in an article submitted to Irish America. I think of her helping to birth babies who would grow up to fight in the Civil War and travel beyond the confines of New York, building this great nation. Alas, as with many Irish stories, there is a sad note. Seneca was destroyed, its villagers scattered to make way for Central Park. I’ve heard the phrase “the great scattering” used in the context of the Irish diaspora, for indeed, we were scattered to the four corners of the world by conflict and starvation. But, as with all great Irish gatherings, the focus on this occasion was celebrating life, and success, with a nod to past generations who helped make that success possible. Eileen McDonnell, the chairman and CEO of life insurance giant Penn Mutual, gave an evocative keynote address that paid homage to her grandparents, all four of whom had immigrated from Ireland, and one of whom (her grandfather), was a musician from County Clare. Her words reminded us that earlier generations, who made the journey across the ocean and across the land, to find work in mining camps and dig canals, didn’t have much in the way of material goods, but that they carried their music with them. And on this grand occasion, Niamh’s soaring voice, paired with Shu’s guitar notes, provided a soulful connection to the ancestors. And, both being immigrants, they reminded us of our nation’s melting-pot heritage. The Eithne & Paddy Fitzpatrick Memorial Fund held its 25th Annual Golf Tournament in May at the Sleepy Hollow Country Club, one of the United States’ most prestigious golf courses, located in Scarborough, NY. Well-known hotelier John Fitzpatrick, pictured third from left in the above photo, founded the Eithne & Paddy Fitzpatrick Memorial Fund in 1993 in memory of his late parents to honor the charitable spirit they demonstrated throughout their lives. Since its inception, the fund has raised $4 million for a variety of worthy causes in both Ireland and the United States. Some of these include the Barretstown Camp, the Integrated Education Fund, the Mary Robinson Library, and the New York Irish Center. The fund’s latest project was the O’Hanlon Park Boxing Club in Dundalk, which just reopened in a spacious new facility that will be used by over 200 children and adults daily. This is just the latest of the fund’s accomplishments in its 25 years of working together to help those in need. This year’s event raised over $380,000 and was attended by a variety of Irish public figures, including the Irish Ambassador to the United Nations Geraldine Byrne Nason, former Irish Soccer manager, Mick McCarthy, actor Matt McCoy, and Irish golf pro Eamonn Darcy. 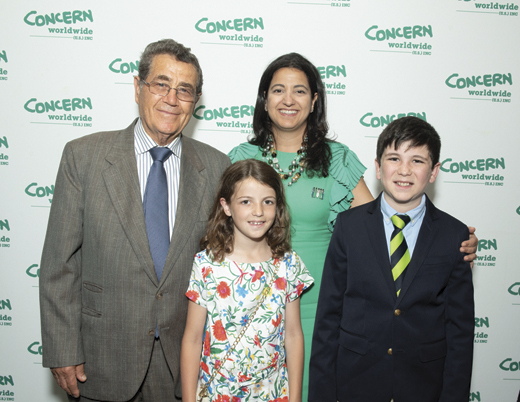 The Women of Concern Annual Luncheon was held on Thursday, June 21 at the Pierre Hotel, with two very worthy honorees, Aine Brazil, Vice Chairman of Thornton Tomasetti, and William Moore, Executive Director of the Eleanor Crook Foundation. Aine, who was born in County Galway, is a leading structural engineer on such projects as the Hudson Yards development on the west side of Manhattan. 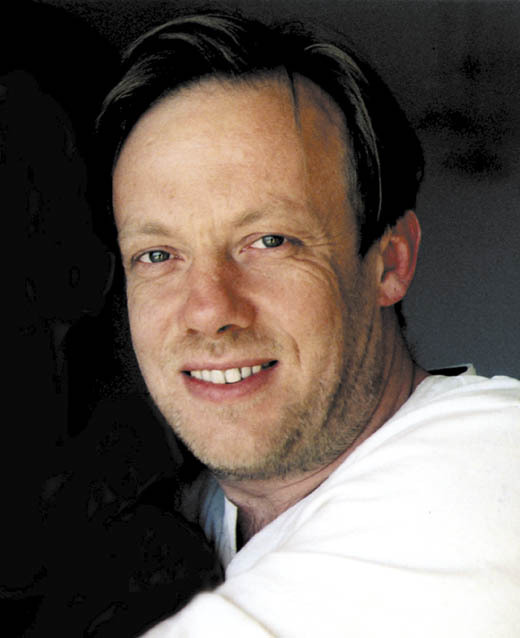 William is stewarding the rapid growth of the Eleanor Crook Foundation’s resources through nutrition advocacy in numerous countries, including Kenya, Tanzania, Uganda, Malawi, and Nigeria. Concern board member, and guest speaker, Jumana Culligan with her family. This year’s event was particularly special, marking Concern’s 50th year as an organization tackling extreme poverty on a global level. The Irish Repertory Theatre began its 30th-anniversary season honoring Tina Sainti Flaherty, the author, philanthropist, and businesswoman, at its annual gala on June 4 at the Town Hall in N.Y.C. Broadway stars, such as Jeremy Irons and Melissa Errico, backed by a live orchestra and a full chorus, celebrated the life and music of Alan Jay Lerner on the centenary of his birth, with long time favorites from Brigadoon, Paint Your Wagon, Gigi, My Fair Lady, and other hit shows. The performance was followed by dinner at Bryant Park Grill. The Irish Repertory Theatre, located at 132 W 22nd St, New York, N.Y., was founded by Charlotte Moore and Ciaran O’Reilly in 1988. 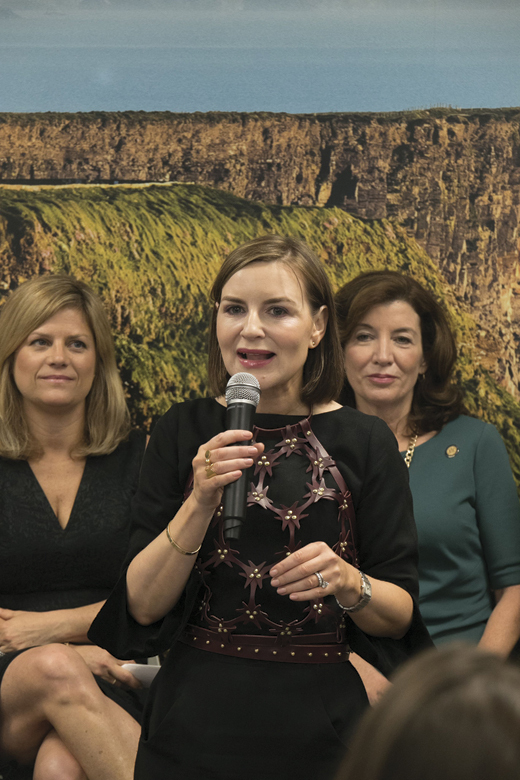 Irish America celebrated its 2018 Power Women in New York this spring with the induction of six phenomenal leaders of business, journalism, and politics. Irish America inducted six amazing women – three Irish-born and three Irish-American – into the magazine’s Power Women group on the morning of May 17. The gathering, at the Bank of Ireland Startlab in New York City, was co-hosted by #WearingIrish, a movement founded in 2016 by Margaret Molloy that connects Irish designers with American entrepreneurs, clients, and potential partners. Margaret Molloy, CMO of Siegel+Gale, founder of #WearingIrish and co-host of the PW event. She is flanked on the left and right by Jenny Rooney and Kathy Hochul, respectively. 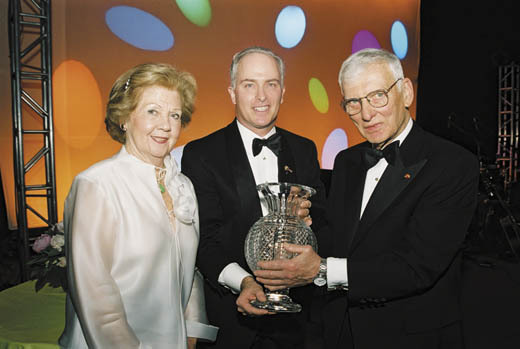 Irish America magazine and Financial Dynamics Business Communications co-hosted the 7th annual Wall Street 50 Awards at the Sky Club on Wednesday, July 14, 2004. Chairman of Allen & Co. Donald R. Keough was the keynote speaker and many noted Irish-American figures of the financial community attended. For millions of people, June 16 is always an extraordinary day. On that day in 1904, Leopold Bloom made his epic journey through Dublin as described by James Joyce in Ulysses, one of the world’s most highly acclaimed modern novels. “Bloomsday” — the St. Patrick’s Day of literature — has become a tradition for Joyce enthusiasts all over the world. 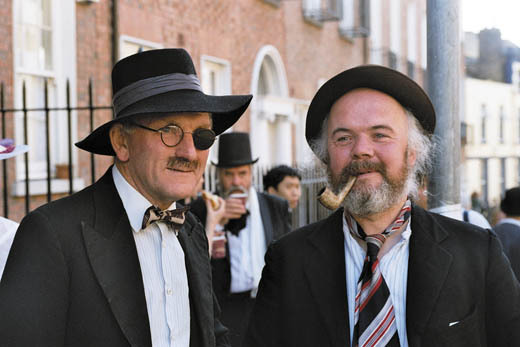 Nowhere is Bloomsday more rollicking or exuberant than in Dublin, home of Molly and Leopold Bloom, Buck Mulligan, Stephen Dedalus, Gerty McDowell and James Joyce himself. The Irish, who reviled Joyce when he was alive, now reverently tramp the streets of Dublin retracing the footsteps of Leopold Bloom, visiting the various places immortalized by this latter-day Edwardian Odysseus. Participants in the ReJoyce festival. But this year Bloomsday was extra special. It is 100 years since that first journey took place, and the Irish are in the midst of a huge, ebullient, multifaceted celebration with the jubilant title ReJoyce. Only the Irish could turn the events of a single day one hundred years ago into a five-month world-class festival, with a spectacular range of theatrical, artistic, musical and educational events. The Irish Museum of Modern Art is hosting “High Faluting Stuff,” an exhibition of Joyce-influenced art, while the Royal Hibernian Academy presents another exhibition of art and installations by Joyce-inspired artists such as Matisse, Brancusi, Jess, Man Ray and even Joyce himself. The National Library of Ireland is featuring an extensive literary exhibition devoted to Joyce, displaying a number of previously unseen notebooks, drafts, and correspondence. Concerts, plays, a film festival, photographic exhibitions, lightshows, pageant and street-theatricals are all part of the fare planned. For those who wish to learn something about Joyce, three venues are in the must visit category. The first is the Martello Tower at Sandycove, (eight miles south of Dublin) which is now the site of the James Joyce Museum. Built as a cannon installation in 1804 against a possible Napoleonic invasion, it is now filled with Joycean memorabilia including rare first editions of his writings (including an edition of Ulysses illustrated by Henri Matisse), personal possessions, letters, documents, photographs and portraits. The top of the tower commands an imposing, and often breezy, view of Dublin Bay, while the room immediately below is still maintained as it was during Joyce’s stay (as a guest) in the Tower. Books, cards and souvenirs are available, with staff on hand to provide a guided tour and answer queries. Across the city, past Trinity College to Dublin’s north side, is the James Joyce Centre (North Great George’s Street) which is located in a beautifully restored 18th century townhouse. Here a wide range of material connected with Joyce, including rare translations of his work, is on display. Also at the Centre, visitors can books guided walking tours that explore the north inner city — Joyce’s creative heartland. The last of the three sites, The James Joyce House, on the banks of the River Liffey at 15 Usher’s Island, is still a work in progress. Dating back to the 13th century, it was the home of Joyce’s aunts, and it was here that “The Dead,” one of his most famous short stories from Dubliners, was set and was later brought to the screen in John Huston’s last film, The Dead. Having lain derelict for nearly two decades, the house was saved from the wrecker’s ball by Dublin barrister Brendan Kilty, who is restoring this important landmark to its former glory. When renovations are completed, visitors will be able to stay at Usher’s Island. The venue can currently be hired for corporate functions and intimate Edwardian dinners, similar to those which Joyce would have attended. Art works by leading Irish artists are on display, and guided tours of the house are available. Re Joyce commenced on April 1 and ends on August 31, bringing Dublin to the focus of world attention. The newly confident, multicultural, refurbished, effervescent, affluent Dublin is seemingly ready not only to embrace its Joycean past, but also to welcome a superfluity of tourists keen to join in and celebrate. This, above all, is the season to visit Dublin to rejoice in ReJoyce. 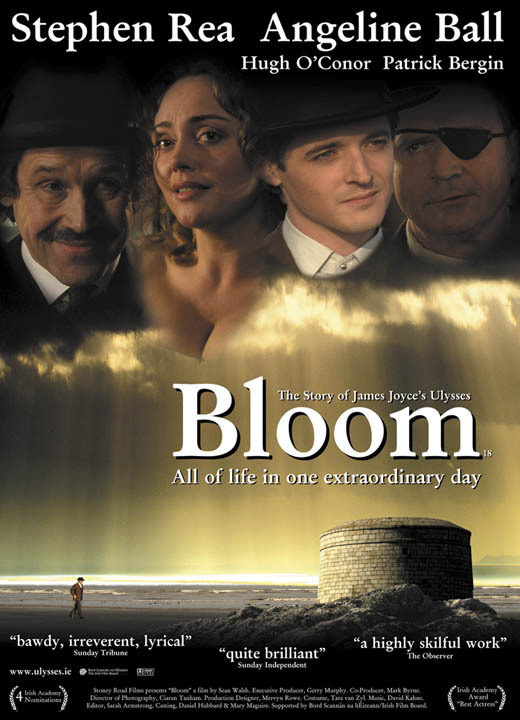 Sean Walsh, the writer, director and producer of Bloom, which stars Stephen Rea as Leopold Bloom and Angeline Ball as Molly, talks to John Hagan. 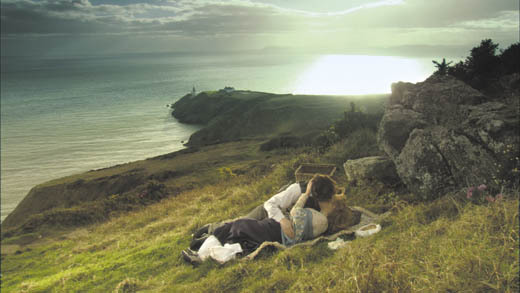 Bloom was screened in New York on June 10 by The Irish Repertory Theatre. At press time, its American distribution was still being negotiated. John Hagan: Most people give up on Ulysses by page eight. What ever possessed you to make a film of it? Sean Walsh: For that very reason! I was attracted to the fact that while Ulysses is recognized as the greatest novel of the 20th century, few people have ever read it. I wanted to bring the story to a wider audience, and reveal the humor, and most importantly, the humanity of the novel. My hope is that anyone who watches it will sympathize with the characters. More importantly, I hope that they will see a part of themselves reflected on the screen. In a previous film of Ulysses made in 1967, its director Joseph Strick believed that a filmmaker’s duty to great books is to copy them literally. Does your approach differ? I believe that the filmmaker should remain faithful to the integrity of the text, but I also think that you have to be aware of the medium of film. We begin with a portion of Molly Bloom’s soliloquy and return to the same point in time at the end of the film. In Joyce’s novel, the soliloquy only occurs in the last chapter but I felt that this wouldn’t work for the movie audience. Bloom is not a big-budget film. How did you manage to attract actors such as Stephen Rea, Hugh O’Connor and Patrick Bergin? SW: All of the cast, and indeed crew, were attracted by the nature of the project, by the script, and also the opportunity to work on an adaptation of the greatest novel of the 20th century. In terms of direction, my approach was fairly simple — I surrounded myself with a highly talented and motivated cast and crew, and I sought their ideas and input at every stage of the film. Honesty and integrity also played a key part; and the atmosphere on the set was amazing. I can honestly say that I can’t imagine ever doing anything as challenging or exhilarating again. Stephen Rea and Angeline Ball in a scene from Bloom. How faithful have you been to Joyce’s Dublin? It was impossible, because of budget, to re-create all the areas depicted by Joyce. However, we spent years looking for and securing the right locations in Dublin that would provide us with the right “feel” and “look” for the film. What difficulties did you face in making the movie? SW: It was all about money. All about raising the five million euros needed to bring it to the screen. 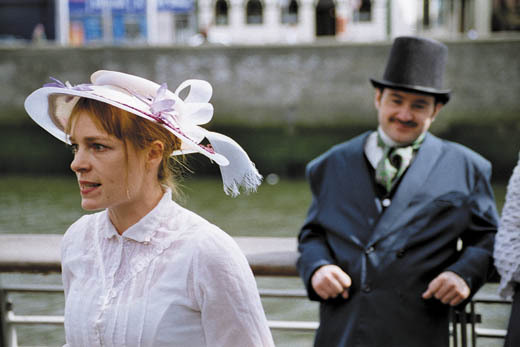 Nobody believed we could actually make a film of Ulysses. 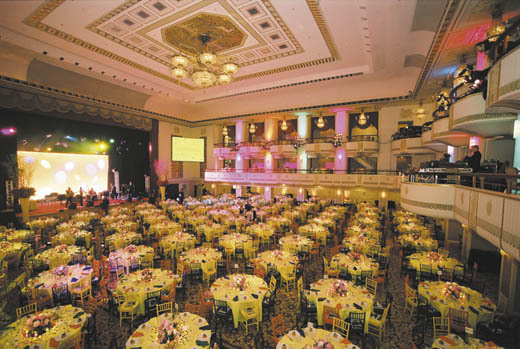 The American Ireland Fund held its Twenty-ninth Annual New York Gala at the Waldorf-Astoria on May 6, 2004. The lavish event was led by dinner Chairman Robert McCann and attended by 1,400 guests. The international organization reached its goal of raising over $2.5 million to support its many cultural and humanitarian programs. County Mayo family lauded for its many achievements. The O’Dwyer family was honored at a benefit for the Lower East Side Tenement Museum in New York City. Three generations of the O’Dwyers, both immigrant and American-born, have worked to improve the lives of citizens of New York City, and many of them have been in Irish America’s Top 100. The oldest of seven children, William O’Dwyer came to New York from County Mayo in 1910 and had a stellar career. Beginning as a policeman, he later became a magistrate, the D.A. of Brooklyn, the Mayor of New York, and the U.S. Ambassador to Mexico. William’s brother Jim, who worked at the FDNY fire brigade, died in 1926 in the line of duty. The youngest brother Paul was a member and president of the New York City Council and was the N.Y.C. Commissioner to the United Nations. Paul also promoted peace and equality in Northern Ireland, and the founding of the State of Israel. The O’Dwyers remain dedicated to positions of service and social activism through the law firm O’Dwyer & Bernstien, a civil and human rights law firm. Paul’s son Brian O’Dwyer is a partner at the firm and is the Chairman of the Board of the Emerald Isle Immigration Center. He is also a former U.N. Human Rights Commissioner. His uncle Frank Durkan — son of Mary O’Dwyer Durkan — is also a partner at O’Dwyer & Bernstien. The family also boasts two court justices in its ranks, Joan O’Dwyer and John Byrne. 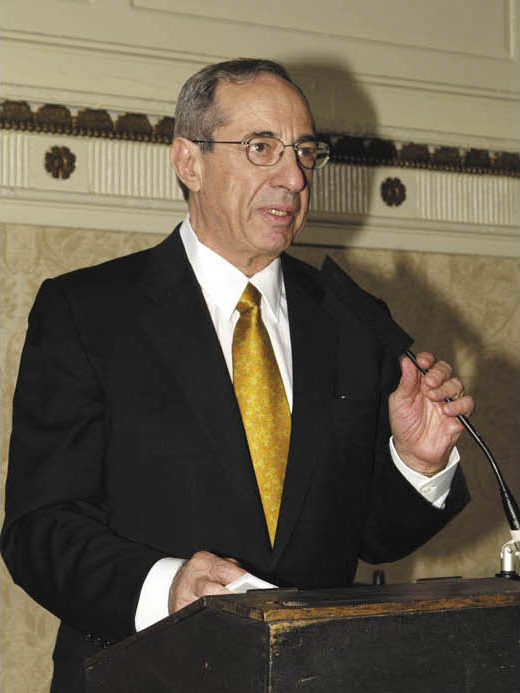 Former New York Mayor Mario Cuomo was one of many who honored the O’Dwyers at the celebration. Recently, real estate tycoon and Irish-American Raymond O’Keefe was named Chairman of the Museum’s Board of Trustees. The Museum is preparing for its upcoming Irish family apartment opening, set for May 2005. The Meehan-Moore family has been chosen to be immortalized in an exhibition to symbolize the Irish immigration story.